Of the total population of Egypt, 98 percent is ethnic Arab/Egyptian. An estimated 1 percent is Berber (at Siwa Oasis in the Western Desert, towards the border with Libya), Nubian (in Upper Egypt, towards the southern border with Sudan), Bedouin (mainly in the Western and Eastern deserts and in the Sinai), or Beja (who mainly live in Sudan). The remainder has Armenian or Greek or other European (mostly Italian and French) roots. The vast majority of the population is Sunni Muslim. The largest minority consists of Coptic Christians, but there are no recent official statistics for their number. According to the census of 1986, 6 percent of population was Coptic Christian. Recent estimates suggest that Copts account for 8 to 10 percent of the domestic population, but there are no accurate data. Apart from Sunni Muslim and Coptic Christian, Egypt is home to small numbers of Catholic Christians, Greek Orthodox Christians, Protestant Christians, Shiite Muslims, Bahais, and a very few Jews. The state officially recognizes only three religions: Islam, Christianity, and Judaism. 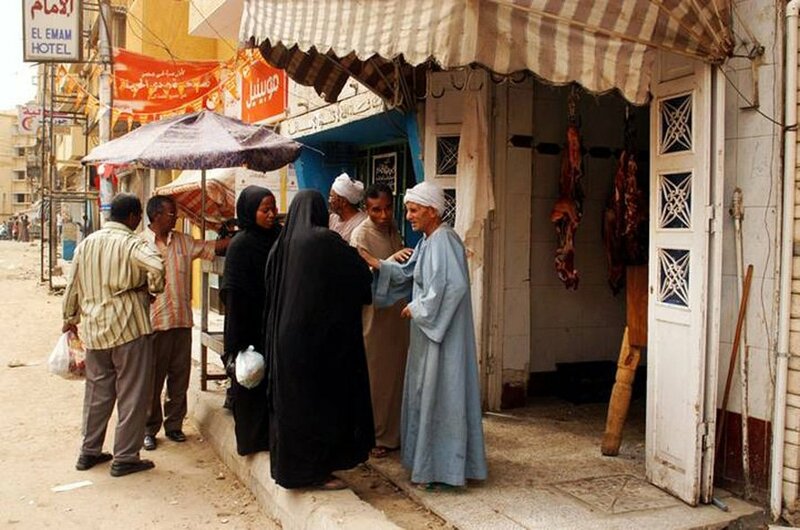 It is estimated that some 2 percent of the total population of Egypt consists of religious and ethnic minorities, such as Bedouin, Nubian, Berber, and Beja. There are also some communities with Greek, Armenian, or Western European (mostly Italian and French) roots. Most of the Bedouin in Egypt live in the Sinai Peninsula, with smaller numbers in the Western Desert and suburbs of Cairo. There are thought to be more than fifty Bedouin tribes in the Sinai, each with their own distinctive dialect of Arabic. It is believed that they descend from Muslims who migrated from the Arabian Peninsula between the 14th and 18th centuries. The Bedouins originally lived as nomads, and some still do. The government has enforced a policy to make them settle in permanent dwellings, with mixed results. Many Bedouin in the Sinai felt disenfranchised after Israel ended its occupation of Sinai – which Israel had conquered during the 1967 June War – in April 1982 and handed it over to Egypt. They say they have been discriminated against by the state, as shown by the lack of development projects and by their being systematically excluded from civil-service positions, the police force, and the military. Egypt’s new military rulers promised to improve the treatment of Sinai residents. Students in Sinai were allowed for the first time in the summer of 2011 to apply to the Police Academy. The main concern in Sinai now is the growing influence of extremist Islamic groups on the Bedouins, some of which are linked to al-Qaeda. Egypt’s Armed Forces conducted a major military operation in August 2011 to eliminate extremist elements that challenged the state and demanded the establishment of an ‘Islamic Emirate of Sinai’. It is unclear how effective the military campaign was, but the challenge the Egyptian government faces in Sinai is long-term and requires a great deal of investment in the development of that ignored region. Nubian village near Aswan, Photo Shutterstock. The Nubian minority in Egypt originally hail mostly from the land between the Sudanese capital Khartoum and the Egyptian city of Aswan. Their original lands within the Egyptian border were flooded by the Aswan High Dam in the 1960s and the expansion of Lake Nasser. Many were forced to resettle in other areas in southern Egypt, while others moved to the northern cities to seek work. In recent years, several Nubian groups have made efforts to revive Nubian culture and traditions. The Siwa Oasis, about fifty kilometres from the Libyan border, is home to a community of some 25,000 Berbers, an ethnic group indigenous to North Africa. Siwa is one of Egypt’s most isolated oasis settlements; the local Berbers speak a distinct (Berber) language known as Siwi. Small numbers of Beja, famously called ‘Fuzzy Wuzzies’ in Rudyard Kipling’s poem by that name, are found in far southern Egypt, mostly in the Eastern Desert, towards the Red Sea coast. 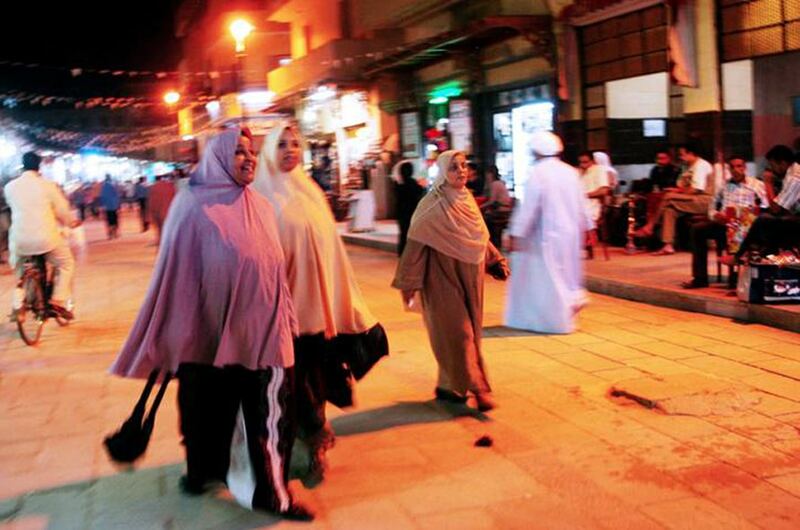 Egypt’s population is expected to continue to grow at an annual rate of nearly 2 percent. It is estimated that the population will surpass 100 million by 2025. Egypt’s population is young. Over 30 percent is under 15 years of age, and only 6 percent is over 60 years. This so-called youth bulge is leading to pressure on the labour market and social services. In 2006 the labour force grew by 5 percent to 22.9 million people. Many are unable to find a job or have to accept employment well below their expectations and level of education. According to the 2006 census, 48.9 percent of the population was female in both urban and rural areas. The average size of the Egyptian household is 4.2 members (urban 3.9, rural 4.4). National statistics indicate that 57.4 percent of total population lives in rural areas and 42.6 percent in cities. This ratio has scarcely changed over the past decade. The average annual growth rate of the urban population has been a stable and modest 2 percent in the past decade, but Cairo has seen an explosion in its population. While the capital held little more than 25 percent of urban population in 1996, that has increased to almost 70 percent in 2008. The government has made efforts to control the population increase with public-awareness campaigns, and the fertility and birth rates have been reduced significantly in the past decades, almost to 1.9 percent, according to the Egyptian government’s estimate in 2010. The main causes for fertility changes have been the fact that more people now marry at an older age, a declining desire for large families, urbanization, education, and an increased use of contraceptives. But because the mortality rate has fallen as well, the population has continued to grow at unsustainable rates. Mortality decline has been the result of improved immunization, reduced occurrence of diarrheal diseases through public-health measures, and improved living standards. Given the limited resources and space and insufficient job opportunities for the young, the growing population is leading to strains on the economy, society, and the environment. 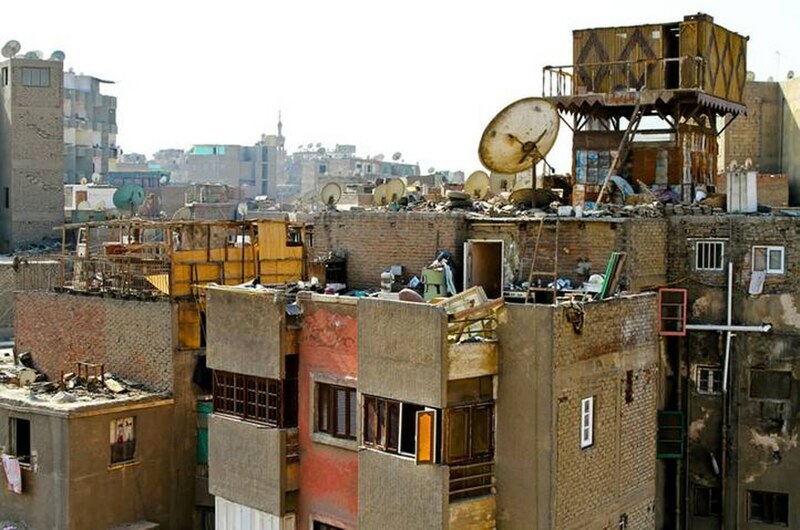 With an estimated 81 million people in 2011 (Egypt’s Central Agency for Public Mobilization and Statistics, CAPMAS), Egypt has the largest population in the Middle East and North Africa and one of the highest population densities in the world, due to the lack of habitable space. Only 7.84 percent of total land area on both sides of the Nile River and the Delta is cultivated and inhabited. More than 97 percent of the population lives on that narrow strip of land. Egypt’s population density is 70 per square kilometre overall, but in the non-desert populated areas it increases to 1,540 per square kilometre. Cairo, with a population of 7.8 million people, has a staggering population density of 40,890 per square kilometre. Overcrowding has led to scores of problems over the past decade, such as unemployment and difficulties in providing public services. According to the Peterson Institute for International Economics (Washington D.C.), Egypt’s basic problem is unemployment driven by a demographic youth bulge: with the number of new people entering the job force growing at about 4 percent a year, unemployment in Egypt is almost ten times as high for college graduates as it is for people who have gone through elementary school, particularly educated urban youth. (Those young people were heavily represented in the mass protests that began on 25 January 2011 in several Egyptian cities). Moreover, overpopulation has caused depletion of natural resources, environmental destruction, and greatly increased pollution. With one in four youths under 25 still jobless after the revolution, one of the biggest challenges facing policymakers in Egypt is its growing population. According to government data almost 4 million Egyptians were living abroad in December 2007 (the real figure is much higher). Unemployment and underemployment have led many young Egyptians to seek opportunities elsewhere. National surveys show that Egyptian migrants are mostly young, relatively well educated males. Two-thirds of this migration is temporary, mainly labour migration to oil-rich Gulf states. A smaller proportion finds work in the agricultural sector in neighbouring Libya, at least until the 2011 uprisings. One-third of the emigration is permanent, mainly to the United States, Canada, Australia, and, increasingly, Western Europe, especially Italy and Greece. A disproportionally large number of Copts have emigrated, mostly to Western destinations, but accurate statistics are not available. In the past two decades, temporary labour migration from Egypt to the Arab Gulf states has decreased to one-third of the total migration, indicating fewer job opportunities for Egyptians, who are losing out to cheaper labour from Pakistan, India, and Bangladesh. Regarding illegal migration, Egypt used to be a transit country for Asian immigrants moving through the Suez Canal and across the Mediterranean to Europe. Now Egypt is a place of both origin and of transit for immigrants to Europe. There are no official numbers, but increasing numbers of young Egyptians cross the Libyan border illegally to board vessels to cross the Mediterranean. Overloaded and poorly maintained vessels often get into trouble, and passengers perish. Remittances from Egyptian expatriates are a major source of foreign-exchange receipts, amounting to USD 7.9 billion in 2010. 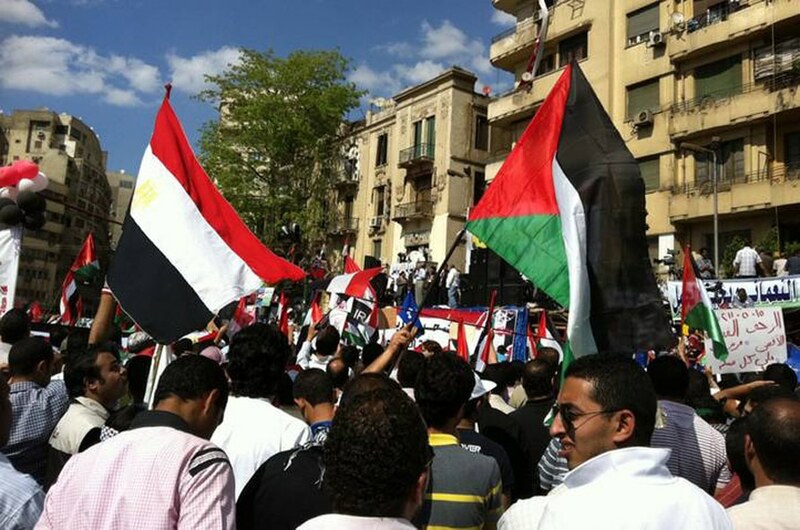 Egyptian and Palestinian flags in the streets together in the 2011 uprising. Data on the number of refugees in Egypt are sketchy. Neither the Egyptian State Information Service nor any other governmental agency discloses any statistics. According to the CIA World Factbook, Egypt hosted only about 150,000 refugees in 2009. According to the UNHCR, in 2012, just under 115,000 people were of concern to the organization, many of whom fled to Egypt following the violence in Libya. 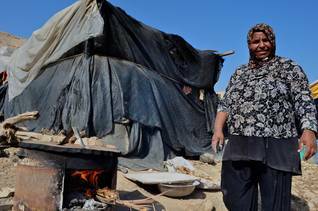 It is estimated that Egypt is home to at least 70,000 refugees from the Palestine (OPT), mostly displaced from the West Bank and the Gaza Strip in the Arab-Israeli wars. Egyptian law allows Palestinians to obtain a travel document, but if they leave Egypt, they must obtain a visa to return to Egypt. Palestinians holding such a document and who were born in Egypt or have lived there for most of their lives, have no automatic right to stay in Egypt or re-enter the country. They must renew their visas on a regular basis, depending on the reason for their stay in Egypt. Many Palestinians stay in Egypt illegally because they do not meet these requirements. Palestinians are allowed the same education as any Egyptian national, but they have to pay higher fees. Children of Egyptian women who marry Palestinian men are also prohibited from gaining citizenship automatically. In contrast, the child of a Palestinian woman married to an Egyptian man is recognized as Egyptian. In 2011, after the fall of President Hosni Mubarak, the Interior Ministry agreed for the first time to grant Egyptian citizenship to the children of Egyptian mothers married to Palestinians, on a case-by-case basis. A number of Arab countries refuse to grant citizenship to Palestinians in order that they not lose their refugee status in case of a future settlement with Israel. Since the outbreak of the recent conflict in Syria, Egypt has become a safe haven also for an unknown number of Syrian refugees of various religious and ethnic backgrounds. Egypt has also received a substantial number of Iraqi refugees since the Iraq War began in early 2003, although far fewer than Syria and Jordan have absorbed. The UNHCR has counted 19,250 refugees and 500 actual asylum seekers from Iraq in Egypt, but these numbers have reportedly decreased in the past two years, to 7,400 in January 2012, as the security situation improved in Iraq. 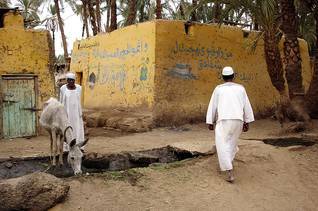 The number of Sudanese refugees living in Egypt is unclear. The Four Freedoms Agreement between Egypt and Sudan signed in 2004 grants Sudanese and Egyptians the freedoms of movement, residence, ownership, and work in either country. While estimates of the number of Sudanese in Egypt vary from 500,000 to 3 million, it is not known how many of them should be categorized as refugees. The UNHCR says there are 10,300 refugees and 14,500 asylum seekers from Sudan in Egypt in January 2012. Most of the Sudanese refugees came from southern Sudan due to the civil war that went on there for decades. Although a new state, South Sudan, was recognized on 13 July 2011 as a member by the United Nations Security Council (Resolution 1999), there were no reports on the return of large numbers of southern Sudanese living in Egypt to their new country, probably because of deteriorating economic conditions. In addition there are approximately 6,600 Somali refugees in Egypt and 2,200 other (mostly African) refugees. In the category of ‘freedom of conscience and belief’ on the Freedom House (Washington, D.C.) scale Egypt scores only 2.33 out of a possible seven points. There seems to be a contradiction in the Egyptian Constitution, which states that Islam is the official religion and that the Sharia (Islamic law) is the principal source of legislation, while at the same time it provides for the freedom of religious belief and practice, as long as these are not in conflict with the Sharia. However, the Sharia prohibits conversion from Islam, and conversion from Islam to Christianity is rejected by the courts. Since 2007, only a few dozen Christians, who had converted to Islam and wanted to return to their original faith, have been able to change their papers through a court order. There is some formal and informal discrimination against Copts in Egypt. 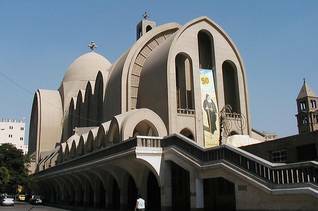 Although the government claims that there are no religious tensions in Egypt, religious strife does surface occasionally. Often these clashes are caused by anger in a community over alleged love-relationships between a Muslim and a Christian or because of rumoured abductions of girls. 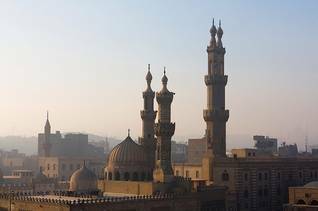 al-Azhar Mosque in Cairo, Photo Shutterstock.